Tivoo-Max is more than just eye candy. Every detail is a result of thoughtful engineering. When you’re listening to music, the speaker is powerful, but it also serves as a smart alarm, pixel art display, social media notification center and more. Today, Tivoo-Max by Divoom, launches on Indiegogo to provide a Bluetooth speaker unlike anything on the market. Tivoo-Max combines top-of-the line audio and sound quality with a brilliant LED panel and mobile application to provide an experience unlike any other. This speaker enhances a user’s quality of life by bringing together art, function and imagination. From the audio capabilities to the LED display and accompanying mobile application, Tivoo-Max inspires users to showcase their personality in art and sound and enhance their daily life with the alarm and other everyday features including social media notifications, activity planners, calendars, games and more. More than a speaker, Tivoo-Max is a piece of art. For those who want beautiful images to display, but lack creative inspiration, they can join the largest pixel art community of more than a million talented artists and choose from a massive variety of graphics, videos, GIFs and games. Whether a person is a novice artist or someone with more experience, the online community is the perfect place for to improve and become a pixel art animator – Divoom is constantly updating and improving drawing aid tools. Using the free online community, users can even share, like, comment and interact with others’ designs. Designed with the latest DSP technology, the speaker is composed with 40 watts and a 2.1 stereo setup. It delivers a strong punch of bass with a 20W active subwoofer and bass port chassis design to increase the bass effect. The 256 programmable LED panel is capable of creating 16 million colors and can be used to display graphics, videos, GIFs, clocks, weather reports and more. With this immersive lighting experience there really are no limits. The Tivoo-Max dimensions are 184.5mm x 163mm x 86mm and the battery lasts up to 10 hours on a full charge. Tivoo-Max is currently available on Indiegogo starting at $99. For more information or to pre-order, visit pr.go2.fund/tivoo . 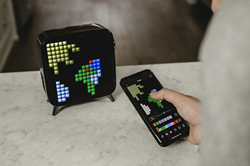 Established in 2006, Divoom has made a name for themselves by creating the most innovative and refined audio products; they are the company behind pixel art speakers. The Divoom brand was inspired by a love of music and the passion for fine audio. Divoom’s goal is to develop innovative audio products that excel in aesthetic design and audio performance for all music lovers. For more information about Tivoo-Max by Divoom, visit https://producthype.co/tivoo-max-speaker/.